Morocco controls 75% of the territory, the Polisario Front controls 25%. 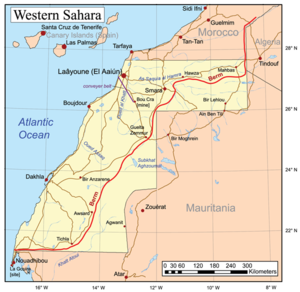 The Western Sahara War (Arabic: حرب الصحراء الغربية‎, French: Guerre du Sahara occidental, Spanish: Guerra del Sahara Occidental) was an armed struggle between the Sahrawi indigenous Polisario Front and Morocco between 1975 and 1991, being the most significant phase of the Western Sahara conflict. The conflict erupted after the withdrawal of Spain from the Spanish Sahara in accordance with the Madrid Accords (signed under the pressure of the Green March), by which it transferred administrative control of the territory to Morocco and Mauritania, but not the sovereignty. In late 1975, the Moroccan government organized the Green March of some 350,000 Moroccan citizens, escorted by around 20,000 troops, who entered Western Sahara, trying to establish a Moroccan presence. While at first met with just minor resistance by the POLISARIO, Morocco later engaged a long period of guerrilla warfare with the Sahrawi nationalists. During the late 1970s, the Polisario Front, desiring to establish an independent state in the territory, attempted to fight both Mauritania and Morocco. In 1979, Mauritania withdrew from the conflict after signing a peace treaty with the POLISARIO. The war continued in low intensity throughout the 1980s, though Morocco made several attempts to take the upper hand in 1989–1991. A cease-fire agreement was finally reached between the Polisario Front and Morocco in September 1991. Some sources put the final death toll between 10,000 and 20,000 people. The conflict has since shifted from military to civilian resistance. A peace process, attempting to resolve the conflict has yet produced any permanent solution to Sahrawi refugees and territorial agreement between Morocco and the Sahrawi Republic. 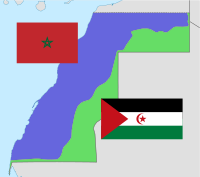 Today most of the territory of Western Sahara is under Moroccan control, while the inland parts are governed by the Sahrawi Arab Democratic Republic, managed by the Polisario Front. In 1884 Spain claimed a protectorate over the coast from Cape Bojador to Cap Blanc. Later, the Spanish extended their area of control. In 1958 Spain joined the previously separate districts of Saguia el-Hamra (in the north) and Río de Oro (in the south) to form the province of Spanish Sahara. Raids and rebellions by the indigenous Saharan population kept the Spanish forces out of much of the territory for a long time. Ma al-Aynayn, the Saharan caïd of Smara, started an uprising against the French in the 1910s, at a time when France had expanded its influence and control in North-West Africa, he died in the same year and his son El Hiba succeeded him. French forces defeated him when he tried to conquer Marrakesh, and in retaliation destroyed the holy city of Smara in 1913. Not until the second destruction of Smara in 1934, by joint Spanish and French forces, did the territory finally become subdued. Another uprising in 1956 – 1958, initiated by the Moroccan Army of Liberation, led to heavy fighting, but eventually the Spanish forces regained control, again with French aid. However, unrest simmered, and in 1967 the Harakat Tahrir arose to challenge Spanish rule peacefully. After the events of the Zemla Intifada in 1970, when Spanish police destroyed the organization and "disappeared" its founder, Muhammad Bassiri, Sahrawi nationalism again took a militant turn. In 1971 a group of young Sahrawi students began organizing what came to be known as The Embryonic Movement for the Liberation of Saguia el-Hamra and Rio de Oro. After attempting in vain to gain backing from several Arab governments, including both Algeria and Morocco, but only drawing faint notices of support from Libya and Mauritania, the movement eventually relocated to Spanish-controlled Western Sahara to start an armed rebellion. The Polisario Front was formally constituted on 10 May 1973 in the Mauritanian city of Zouirate, with the express intention of militarily forcing an end to Spanish colonization. Its first Secretary General was El-Ouali Mustapha Sayed. On 20 May he led the Khanga raid, Polisario's first armed action, in which a Spanish post manned by a team of Tropas Nomadas (Sahrawi-staffed auxiliary forces) was overrun and rifles seized. Polisario then gradually gained control over large swaths of desert countryside, and its power grew from early 1975 when the Tropas Nomadas began deserting to the Polisario, bringing weapons and training with them. At this point, Polisario's manpower included perhaps 800 men, but they were backed by a larger network of supporters. A UN visiting mission headed by Simeon Aké that was conducted in June 1975 concluded that Sahrawi support for independence (as opposed to Spanish rule or integration with a neighbouring country) amounted to an "overwhelming consensus" and that the Polisario Front was by far the most powerful political force in the country. While Spain started negotiating a handover of power in the summer of 1975, it ceded the administrative control of the territory to Mauritania and Morocco only after signing the Madrid Accords. However, on 31 October 1975, Moroccan troops crossed into the territory from the north-east, advancing towards Mahbes and Farciya. Moroccan government organized the Green March of some 350,000 Moroccan citizens, escorted by around 20,000 troops, who entered Western Sahara, trying to establish Moroccan presence. While, at first meeting just minor resistance by the Polisario, Morocco had later engaged in a long guerrilla warfare with the Sahrawi nationalists. During the late 1970s, After Moroccan pressure through the Green March of 6 November, Spain entered negotiations that led to the signing of the Madrid Accords by which it ceded unilaterally the administrative control of the territory to Mauritania and Morocco on November 14, 1975. The United Nations did not recognize the accord, considering Spain as the administrative power of the territory. In the fall of 1975, as a result of the Moroccan advance, tens of thousands of Sahrawis fled Morocco-controlled cities into the desert, building up improvised refugee camps in Amgala, Tifariti and Umm Dreiga. On December 11, 1975, the first Moroccan troops arrived in El Aaiún, and fighting erupted with the POLISARIO. On December 20, Mauritanian troops succeeded taking over Tichy and La Güera, after two weeks of siege. On January 27, the first battle of Amgala erupted between Morocco and Algeria with the Polisario. In January 1976, the Royal Moroccan Air Force also bombed the refugee camps in the northern part of the territory. The following month, Moroccan jets attacked the Umm Dreiga refugee camps with napalm and white phosphorus bombs, killing thousands of civilians. On February 26, 1976, Spain officially announced its full withdrawal from the area. The Polisario Front proclaimed the Sahrawi Arab Democratic Republic on 27 February 1976 and waged a guerrilla war against both Morocco and Mauritania. The World Court at the Hague had issued its verdict on the former Spanish colony just weeks before, which each party interpreted as confirming its rights on the disputed territory. After the completion of the Spanish withdrawal, and in the application of the Madrid Accords in 1976, Morocco took over the Saguia El Hamra and the northern two-thirds of the territory, while Mauritania took control of the southern third. It was ratified on 14 April 1976 agreement. The Polisario Front retaliated the Moroccan offensive with guerrilla attacks, and moved their base to Tindouf in western Algeria, where first refugee camps were established in May 1976. For the next two years the Polisario movement grew tremendously, as Sahrawi refugees flocked to the camps fleeing from the Moroccan and Mauritanian armies, while Algeria and Libya supplied arms and funding. Within months after the 1975–1976 Moroccan offensive, Polisario had expanded to thousands of armed fighters. The reorganized army was able to inflict severe damage through guerrilla-style hit-and-run attacks against Moroccan forces in Western Sahara but also raided cities and towns in Morocco and Mauritania proper. Mauritania, under the regime of Ould Daddah, had a weakened army of 3,000 men, which was unable to fend off the attacks. After repeated strikes at the country's principal source of income, the iron mines of Zouerate, the government was nearly incapacitated by the lack of funds and the ensuing internal disorder. Ethnic unrest in the Mauritanian Armed Forces also strongly contributed to the ineffectiveness of the army: forcibly conscripted black Africans from the south of the country resisted getting involved in what they viewed as a northern intra-Arab dispute, and the tribes of northern Mauritania often sympathized with Polisario, fearing possible Moroccan regional ambitions and presenting perceived increasing dependence of the Daddah regime on Moroccan support. From the mid-1980s Morocco largely had kept Polisario troops off by building a huge berm or sand wall (the Moroccan Wall). The Moroccan army stationed a number of troops roughly the same size as the entire Sahrawi population to defend the wall, enclosing the Southern Provinces, the economically useful parts of Western Sahara (Bou Craa, El-Aaiun, Smara etc.). This stalemated the war, with no side able to achieve decisive gains, but artillery strikes and sniping attacks by the guerrillas continued, and Morocco was economically and politically strained by the war. Morocco faced heavy burdens due to the economic costs of its massive troop deployments along the Wall. Economic and military aid was sent to Morocco by Saudi Arabia, France and the United States to relieve the situation, but matters gradually became unsustainable for all parties involved. On 7 October 1989, Polisario launched a massive attack against Moroccan troops in Guelta Zemmour (Centre of Western Sahara) and Algeria, but sustained heavy casualties and withdrawn after leaving more than 18 tanks burning and a dozen more vehicles. This setback let the Polisario consider a ceasefire. 1991 Tifariti offensive was the last military operation and successful maneuver in Western Sahara War launched by Moroccan forces against the Sahrawi guerrilla fighters of the Polisario Front. During August–September 1991 the Royal Moroccan Army (RMA) conducted offensive operations in the areas of Mehaires, Tifariti, and Bir Lahlou and cleared the area of any Polisario presence. A cease-fire between the Polisario and Morocco, monitored by MINURSO (UN) has come into effect on 6 September 1991, with the promise of a referendum on independence the following year. The referendum, however, stalled over disagreements on voter rights, and numerous attempts at restarting the process (most significantly the launching of the 2003 Baker plan) seem to have failed. The prolonged cease-fire has held without major disturbances, but Polisario has repeatedly threatened to resume fighting if no break-through occurs. Morocco's withdrawal from both the terms of the original Settlement Plan and the Baker Plan negotiations in 2003 left the peace-keeping mission without a political agenda: this further increased the risks of renewed war. On 24 June 1975, a Land Rover of the Spanish Army struck a land mine as it was patrolling the Spanish Sahara-Morocco border, killing the five soldiers inside. On 25 June 1975, two reconnaissance planes from the Spanish Air Force were attacked by Moroccan forces near the Spanish Sahara-Morocco border. On 17 January 1980, the Spanish SPS Almirante Ferrandiz (D22) destroyer was machine-gunned by a Moroccan Mirage airfighter, 5 miles away the southern coast of Western Sahara. The Spanish destroyer had received a S.O.S. from a Spanish fishing vessel that had been previously detained by a Moroccan patrol boat. On 24 February 1985, the Polar 3, a Dornier 228-type research airplane from the Alfred Wegener Institute was shot down by guerrillas of the Polisario Front over Western Sahara. All three crew members died. Polar 3, together with unharmed Polar 2, was on its way back from Antarctica and had taken off in Dakar, Senegal, to reach Arrecife, Canary Islands. The German government, which did not recognize Morocco's claim to Western Sahara at the time and remained neutral in the conflict, heavily criticized the incident. In 1984, Polisario shot down a Belgian, and two Moroccan aircraft. ^ "Argelia acusa la derrota de Angola". ABC (in Spanish): 41. 1976-02-07. Retrieved 2012-07-24. ^ Anouar Boukhars; Jacques Roussellier (18 December 2013). Perspectives on Western Sahara: Myths, Nationalisms, and Geopolitics. Rowman & Littlefield Publishers. p. 77. ISBN 978-1-4422-2686-9. ^ Véronique Dudouet (15 September 2014). Civil Resistance and Conflict Transformation: Transitions from armed to nonviolent struggle. Routledge. p. 20. ISBN 978-1-317-69778-7. ^ Ho-Won Jeong (4 December 2009). Conflict Management and Resolution: An Introduction. Routledge. p. 19. ISBN 978-1-135-26511-3. ^ a b Paul, Jim; Paul, Susanne; Salek, Mohamed Salem Ould; Ali, Hadssan; Hultman, Tami (1976). "With the Polisario Front of Sahara". MERIP Reports. MERIP reports, JSTOR (53): 16–21. doi:10.2307/3011206. JSTOR 3011206. ^ a b Lewis, Paul (1988-08-31). "Sahara foes move to end their war". NY Times. Retrieved 2010-08-13. ^ "Keeping it secret – the United Nations operation in Western Sahara". Human Rights Watch. October 1995. Retrieved 23 November 2015. ^ J. David Singer, & Melvin Small (1982). Resort to Arms: International and Civil Wars, 1816–1980. Beverly Hills: Sage publications inc. ISBN 978-0-8039-1777-4. ^ Leger Sivard, Ruth (1987). World Military and Social Expenditures 12th ed. (1987–88). Washington D.C.: World priorities. ISBN 978-0-918281-05-0. War statistics table by William G. Eckhardt. ^ "Project Disappeared: Western Sahara". www.desaparecidos.org. ^ Solá-Martín, Andreu (2007). The United Nations Mission for the Referendum in Western Sahara. Lewinston, NY: The Edwin Mellen Press. p. 102. ^ "Open Society Foundations" (PDF). Open Society Foundations. ^ J., Brill, E. (1993). E.J. Brill's first encyclopaedia of Islam : 1913–1936. Vol. 5 L – Moriscos. Houtsma, Martijn Theodoor (Reprint [der Ausg.] Leiden 1913-1938 ed.). Leiden [u.a. ]: Brill. p. 564. ISBN 978-9004097919. OCLC 258059170. ^ "Telquel Online - Online Financial Industry". Telquel Online. ^ Hollowell, Thomas (2009). Allah's garden (1st ed.). Urbana, Ill.: Tales Press. p. 59. ISBN 9780964142398. OCLC 276406143. ^ "The United States and the Western Sahara Peace Process | Middle East Policy Council". www.mepc.org. Retrieved 2018-05-30. ^ a b c d e "MINURSO". MINURSO. ^ Antonio Díaz Fernandez, Los Servicios de Inteligencia Españoles, Alianza Editorial, Madrid, 2005, p. 176. ^  Washington defines to king Hassan II the range of their military aid (in Spanish), published: October 10, 1979, accessed: December 27, 2009. ^ "Un destructor español, ametrallado en aguas del Sahara por un avión marroquí" (in Spanish). El País. 1980-01-22. Retrieved 2010-09-26.